It must be about 20 years ago that I first saw this floppy-fringed Canadian singer. I didn’t really like her look and paid little attention. Until I heard her sing. Miss Chatelaine blew my mind, not to mention my assumptions. Seeing her perform that song live last night felt like a musical dream for me. kd lang live at the Royal Festival Hall. Yesterday’s date stared out at me from our calendar for a few months, our tickets stared out at me from their shelf in our cabinet, and I grew more and more excited as the day neared. Yesterday was a beautiful warm and sunshiney day in London; temperatures hovered around 26 degrees for most of the day. After work I walked along the edge of the Thames from my London Bridge office towards the South Bank, where I’d arranged to meet my husband at the Nelson Mandela bust. It seemed fitting. Much of London was out enjoying the sun and the summer construction of a “beach” along the South Bank. Street dancers performed, families strolled along licking ice lollies, pubs overflowed with chirpy office workers, benches and patches of grass were filled with cheery people enjoying the welcome London sunshine. In lengthening shadows and royal blue sunshine, the balmy evening was simply sublime. Because we booked early for last night’s show, we managed to get great seats in the fifth row from the stage. Little Miss Higgins and Floyd Taylor opened the show with infectiously bouncy old time country music, inspired by her rural home in the Great Northern Plains of Western Canada. After a short interval, kd lang and the Siss Boom Bang Band took the stage and wove musical magic around us for the next hour and a half. Opening with I Confess from her recently-released and beautifully crafted Sing it Loud album, she moved on to The Water’s Edge before sending the audience into raptures with her crazy-fabulous arrangement of Miss Chatelaine. Mixing old and new songs, she sang and she danced and with every word, she reached out from her soul to an adoring audience. She then introduced us to the immensely talented band from lead guitarist, to bass player, drummer, keyboard/piano wizard and then ended with the man who “changed my life”. She met Joe Pisapia at the Ryman Auditorium at the Grand Ole Opry and what we experienced last night is what resulted from “that union”. I’d heard her talk before about the name of the band – Siss Boom Bang is what happens when they play together. They sizzle and they just work. Beautifully. What followed was The Perfect Word, Habit of Mind, Reminiscing (what an adorable love song), Sorrow Nevermore (where kd ditched Josephine to play the banjo) and ended with a powerful rendition of Constant Craving. The audience went ballistic and she and the band left the stage. We wouldn’t let her go, so she returned sans shoes and jacket for the beautiful Inglewood, before her final and delightfully frenetic Sugar Buzz. We still didn’t want her to go. And nor did she. She and the band returned for a third and final encore. She gathered her band closely around her on the stage to perform a song “for all the businessmen here tonight”. A fun and bouncy Pay Dirt was followed by the achingly delicate Hungry Bird. kd lang and the Siss Boom Bang Band then left the stage. They left us screaming for more but knowing we’d just experienced an evening of musical genius. I loved it. k daddy – you have the voice of an angel and I’m a fan. A big fan. 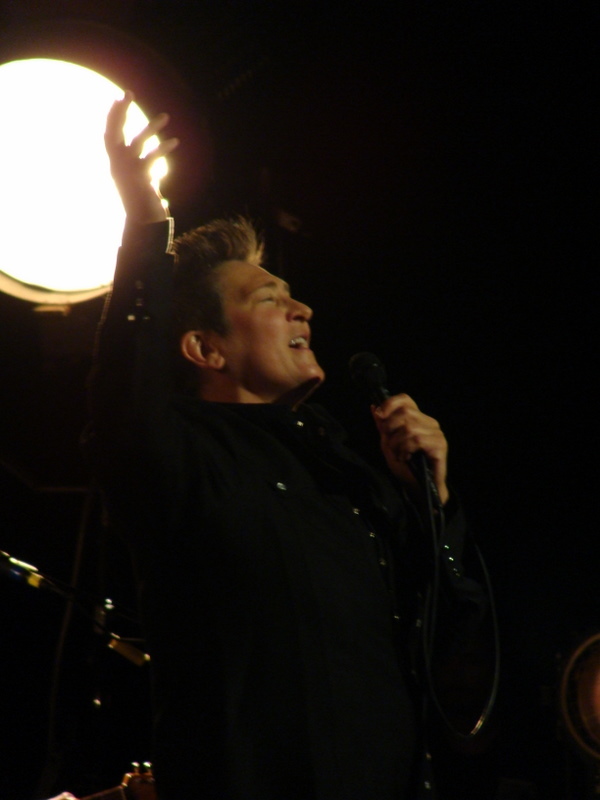 LOVE kdlang, a fellow Canadian…I heard her at Roy Thomson Hall in Toronto and it was a fantastic show. Lucky you! “Miss Chatelaine” was a Canadian young women’s magazine — and the first place I was published; it’s now called Flare. Thought you’d relate to this too, Winn! It was quite an experience, so special. Sounds like an awesome evening, Sunshine! Glad it proved so enjoyable for you, and thanks for your picturesque descriptions — by the way, what are ice lollies??? It was really special, Debbie – what a gift kd has. I love her music, and was so excited to see her live. An ice lolly is frozen fruit juice on a stick – I think you might know it as a popsicle? Sounds like a great evening, Sunshine. k.d. lang has an incredible voice. Amazing, Todd. I just love the tone of her voice and she really is a delightful entertainer! The Siss Boom Bang Band was outstanding too. She has surely become a huge talent! “Constant Craving” is one of my favourites, as well as her version of Leonard Cohen’s “Hallelujah”. Glad you got to see her live, Sunshine! It felt like such a privilege, Wendy, really! I thought of you and thought you might also be a fan of hers. There’s nothing that compares to being at a live performance. You can feel the rhythm and energy in your body. So exciting. What is this about a beach set up right on the river bank? Very true, jacquelin. It literally brings the music alive! How much fun! She is quite the performer! Though I have never seen her in concert, I do love k d lang. Sounds like an amazing evening! Awesome to enjoy those moments so much! A few times I have been to something, and ended up leaving dissapointed. London is so lovely in the summer!! It was really special, mnb! Yes, London takes on a whole new persona when the sun shines! I love how the pubs overflow, and people stand in their business suits and work clothes on pavements outside pubs everywhere; especially on a Friday night! I’m looking up the song on i-tunes as we speak. I have heard a bit about KD Lang, but have never checked her out. Have you heard The Voices (tv show hosted by four singers, including Christina Aguilera) singer Vicci Martinez’s rendition of “Jolene”? Very beautiful. kd’s amazing – let me know what you think! I haven’t heard of The Voices, nor Vicci Martinez, but I’ll check her out now – thanks! Hey Crone – good to see you again! I agree with you about kd – and if you ever get the chance, she’s wonderful to see live.